Every once in a while, I hit a block. I like to call it a “cooking block”. Kinda like writer’s block. I can’t think of anything that I want to cook or that sounds good to me. 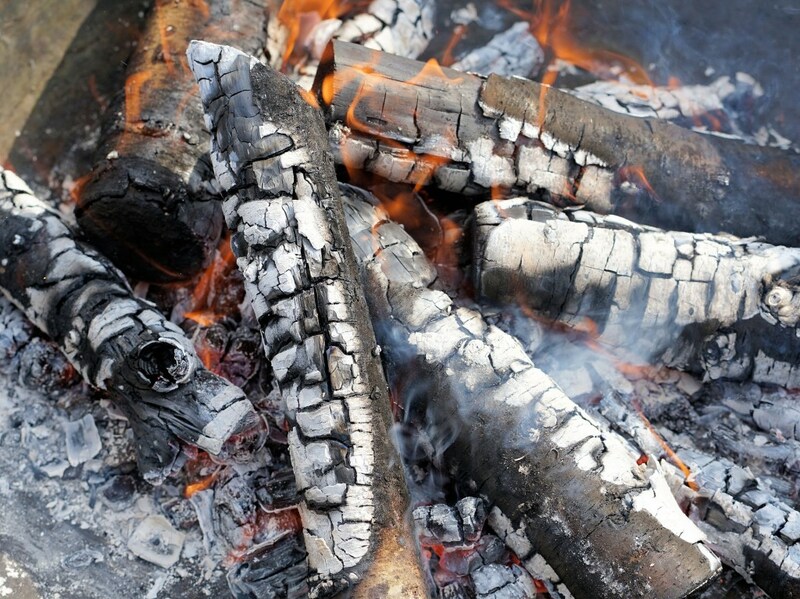 Sometimes visiting barbecue forums will clear it up. Other times food blogs will inspire me. Neither of those have been really working lately, so in a last ditch effort I grabbed some of my favorite cookbooks and started to leaf through them. 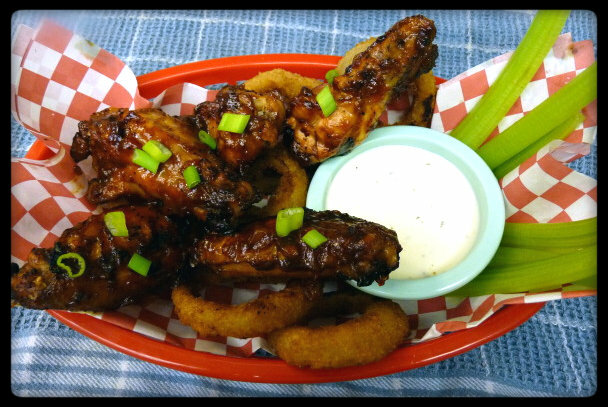 This recipe is good for 2.5 to 3 lbs of chicken wings and will serve 4 to 6 as an appetizer (although I used about a pound and a half because it was only for me). When ready to cook, oil the grill grate. Drain the wings and arrange them on the hot grate. 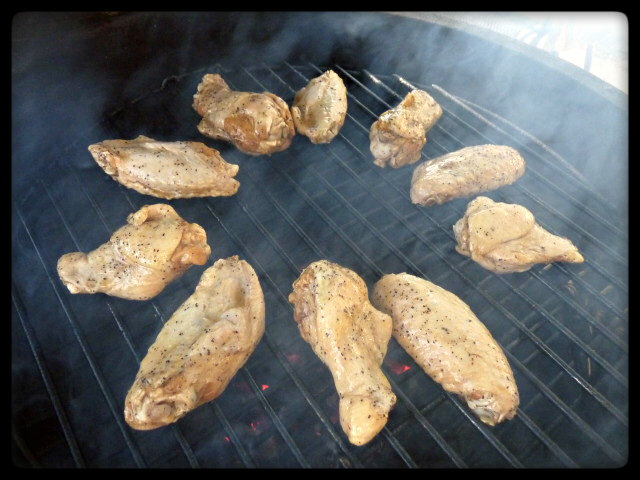 Grill, turning several times with tongs, until the thicker wing sections are no longer pink near the bone, 12 to 16 minutes in all. Start brushing the wings with sauce the last 5 minutes, then transfer to a platter and brush with sauce again. Those are Steven’s instructions, but like I always say, cook to temp not time. Mine ended up taking about 25-30 minutes and got glazed the last 5 to 8 minutes. Make sure to keep an eye on them and turn often after glazing as the sugars in the sauce will burn. Serve accompanied by the reserved sauce. 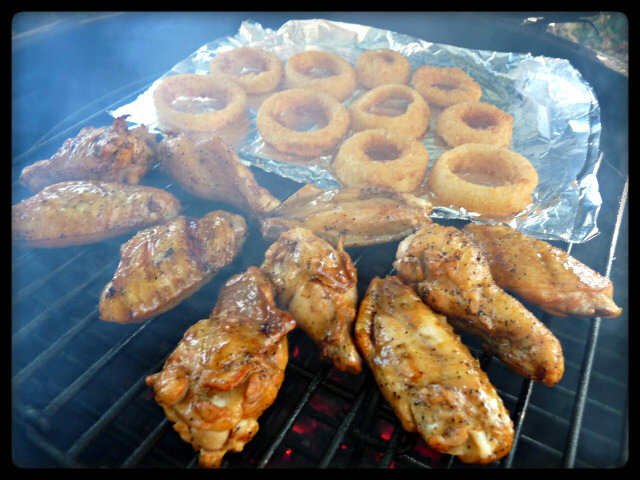 Since man can not live on wings alone, I decided to try some Alexia onion rings on the grill. The grill is like an oven, right? The onion rings are touted as being all natural, gourmet quality onion rings with a light and crispy panko breading. I’m not sure I’ve ever heard onion rings and gourmet quality in the same sentence, but I figured I’d give it a shot on a recommendation from a friend. I let them go for about 10 minutes, flipped them and let them cook for another 5-8 minutes just like the package said. I think in my excitement, I might have gotten a wee bit of a smudge on the lens of the camera. Whoops. These wings were a satisfying change from the normal wings I am used to. The barbecue sauce had many of the typical elements you expect to find, sweet, tangy, a bit tart and a little bit of heat. You can tell there is ketchup in it, but from what I have read barbecue sauce Down Under is a close cousin ketchup. 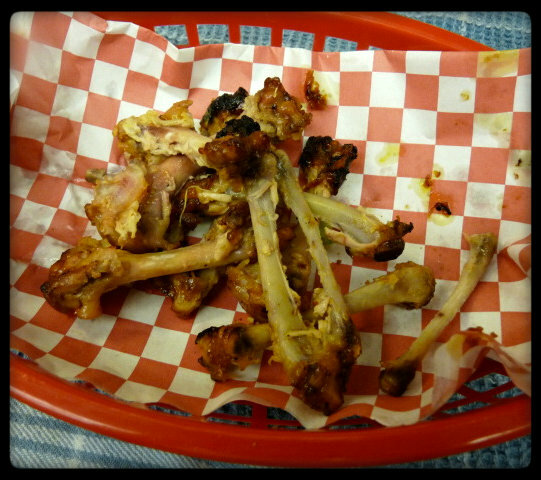 The wings were very messy from being glazed with the sauce, so if you are anything like me, Do NOT wear a white shirt. The first thing you taste is a sweetness, followed by the tang of the red wine vinegar and lemon juice and finally a little of heat at the end. I was pretty sure doubling the red pepper flakes wasn’t going to push it past my heat tolerance. Truth be told, I was actually hoping for a bit more heat. If I make them again, I might increase it some more or add other spices to increase it. 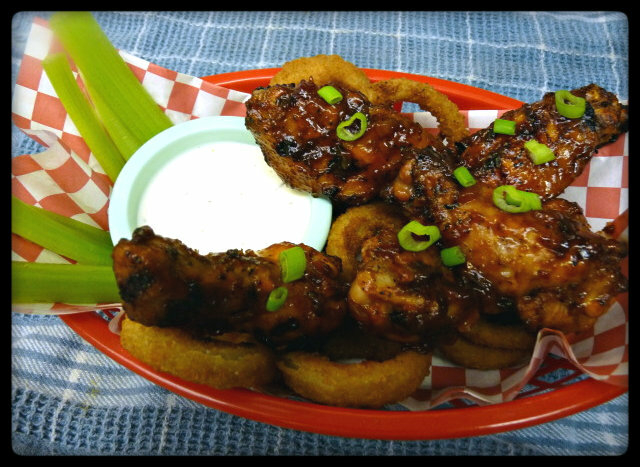 The slight touch of the apple wood smoke really complimented the flavors of the wings as well. Will I ever make them again? I’m not sure. I don’t think Mrs. G would be a big fan of them as she doesn’t really like sweet foods and these start out a bit sweet. (not to mention she’s been telling me I need to make piri-piri chicken wings for here next time I do wings. But that shouldn’t deter you from trying them, especially if you are always looking for new variations of wings like I am. Oh….and the onion rings? They were alright. Crispy like they claimed, but gourmet? Come on! They were frozen onion rings. Nothing special. They must not have been too bad….. Pretty tasty. A bit different than the wings I am used to, but still good. Have it, haven’t used it yet. Need to look into what to do with it. It was a gift so not sure what its for. I was wondering the best way to do wings on the BGE to avoid flare ups. 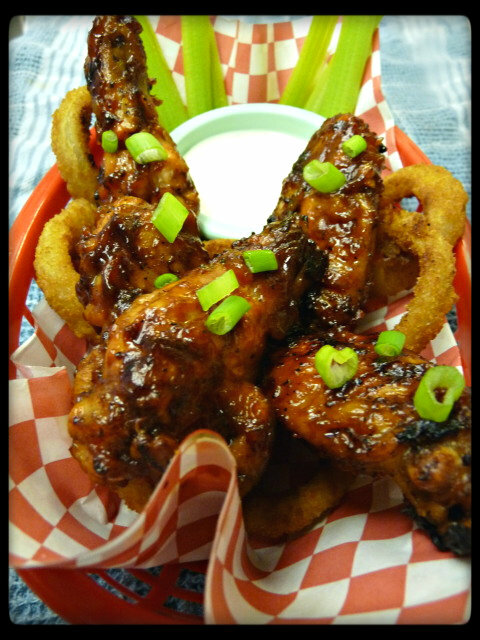 I’ll have to invest in a raised grate…Those wings look fantastic! I would recommend checking out the Ceramic Grill store over getting the BGE one. Tom makes some great products and is a hell of a guy. Tell him I sent ya. I’m just impressed you are firing up your Egg right now. I think all of us BBQ-ers should get a reprieve once the temp gets over 100. 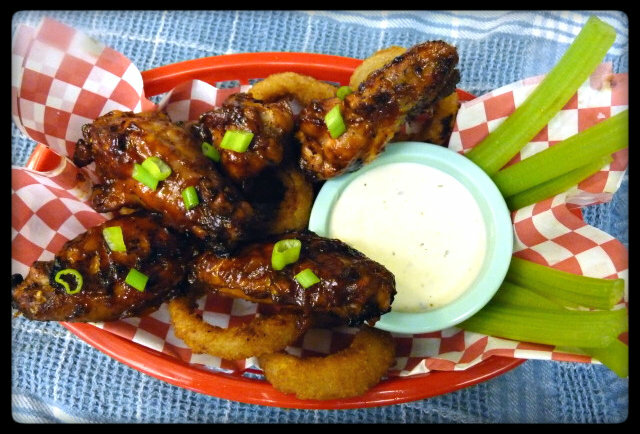 These wings look fantastic and I love the way you plated ’em up! It didn’t get fired up once this weekend and it might not get fired up this week. It’s a short week here at Griffin’s Grub. Mrs. G leaves tomorrow to go to Corpus and I’ll be following on Thursday. They look amazing and your description makes me want to give them a try! Go for it. They aren’t like Buffalo Wings (or hot wings), but they are still pretty tasty.